What better way to fall in love than over pizza and wine? This Valentine’s Day, stop by Sauce Pizza & Wine for a pizza, a salad and two glasses of wine for only $22! 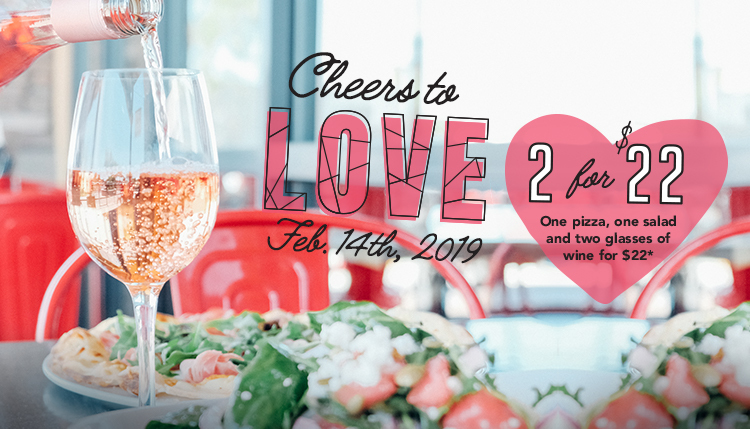 Our 2 for $22 deal will only be available this Valentine’s Day, Thursday, February 14th, 2019. So stop by to indulge with your sweetheart or enjoy a glass of wine for a night out with friends! Get Directions to your nearest Sauce! *One salad ($9.50 or less), one pizza ($11.50 or less) and two glasses of wine ($7 or less) for $22. Can also sub for any entrée ($10 or less) or any other beverage ($7 or less). Cannot be combined with other offers or discounts. Valid at all participating Sauce locations. Valid 2/14/19 only. Dine-in only.